This unique battle also saw a major Japanese counterattack—not a banzai charge, but a carefully thought-out counteroffensive designed to push the Americans off the island and capture the elusive General MacArthur. Both American and Japanese battalions spent days surrounded by the enemy, often until relieved or overwhelmed. Under General Yamashita’s guidance it also saw a rare deployment of Japanese paratroopers in conjunction with the ground assault offensive. Nathan N. Prefer is retired with graduate degrees in Military History. His life-long study of the Second World War has resulted in three prior military studies including MacArthur's New Guinea Campaign, March-August 1944; Patton’s Ghost Corps, Cracking the Siegfried Line and Vinegar Joe ‘s War, Stilwell ‘s Campaigns in Burma. He resides in Fort Myers, Florida. "Finally, a definitive account of the battle that wrested the island of Leyte in the Philippines from the Japanese in 1944 has emerged. Although much has been written about the U. S. Navy's role at Leyte, the savage, bloody fighting that took place on land has been overlooked. Fulfilling his pledge to return after he had been forced to leave the Philippines by PT-boat in early 1942, General Douglas MacArthur pushed the idea of a return to the Philippines with the Joint Chiefs and President Franklin Roosevelt. MacArthur's persistence paid off as soldiers from the Sixth Army, aided by Filipino Guerillas, fought the Japanese from late October 1944 until the beginning of 1945. More than 200,000 Americans not only fought a seasoned enemy but had to endure harsh tropical weather with its incessant monsoon rains and typhoons as well. Two prominent officers who deserve the lion's share of the accolades are General Walter Krueger, commanding the Sixth Army, and General Roberrt Eichelberger, leading the Eighth Army. Both had battlefield experience and did a marvelous job as their troops fought at places with names such as Breakneck Ridge, Shoestring Ridge and Ormoc Valley. In a highly unusual move, the Japanese used airborne infantry to parachute behind the American lines to disrupt the flow of supplies and conduct raids. Prefer has penned a meticulous book, complete with the order of battle for each side, a breakdown of U. S. casualties, detailed maps, and 16 photographs. 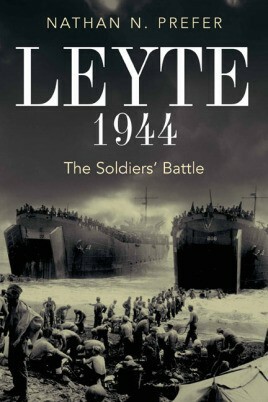 It is a fitting story chronicling the bravery and sacrifices of the dogface GI, and the nearly 3,500 killed and another 10,000 wounded, who beat the very best that the enemy could throw at them and freed the inhabitants of Leyte from a brutal occupation."